Wildwood Canyon Estates. 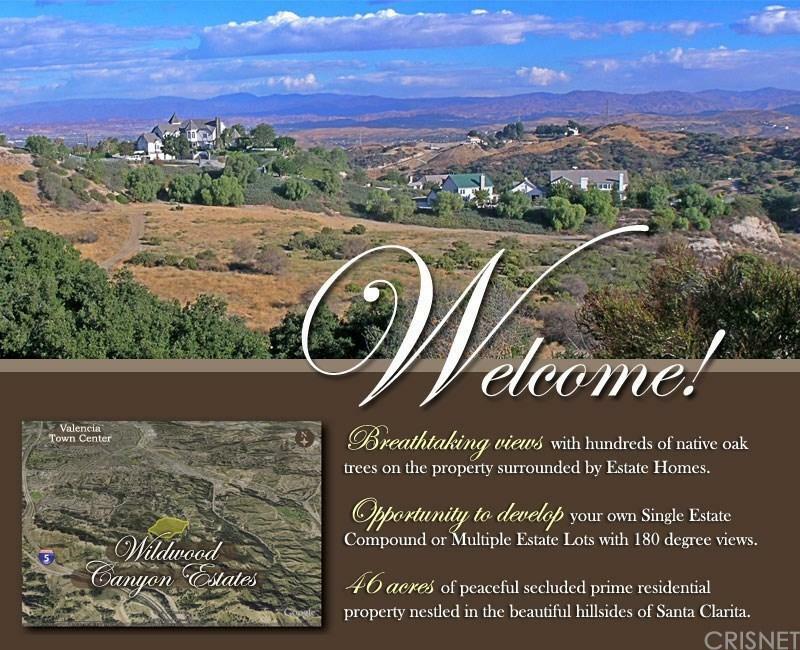 Spacious 46 acres behind gates in prime secluded residential community. Nestled in the valley, perched upon a hill, enjoy the serenity, the evening city lights, the panoramic mountain views. You pick the perfect spot for your dream home--or you can subdivide. There are several excellent building sites. Hundreds of beautiful Oak Trees. Only 7 minutes to Town Center/Valencia Mall. Easy access to your choice of the 14 or 5 freeway--again 7 minutes. 4 minutes to elementary, junior or high schools. Extensive site investigation and preparations are available for your review. You can visit the website (see below) for more details, landscape and aerial photos, possible site plans, reports and additional information. Much has been done to pave the way for a speedy path to build. Oh, did I tell you there are also fully engineered plans for a home that can be modified to fit the size you wish. Just let us know when you wish a tour on site. We'll set it up for you.